«After extensive discussions and comprehensive review of the past experiences, it was agreed to unite and merge the two fronts into a unified organizational structure,» said the leaders of the two factions, Malik Agar and Minni Minnawi in a joint statement extended to Sudan Tribune on Sunday. The two factions held several meetings in the past months to assess their past experience and decided to reunite. North led by Abdel Aziz al-Hilu facilitated the reunification of the armed groups which have similar positions on the negotiations with the government. The joint statement pointed that the victory of the Sudanese revolution would end the war and paves the road to achieve a just and comprehensive peace that addresses the root causes of the Sudanese crisis and the peculiarities of the conflict areas. On the other hand, the two leaders renewed adherence to the armed struggle saying they are committed to the humanitarian ceasefire until achieving a just and comprehensive peace. 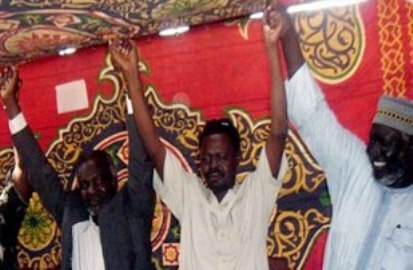 The SRF leaders also called on the SPLM-N led by Abdel Aziz Hilu, the SLM-AW and the Sudan Liberation Forces Alliance (SLFA) led by Tahir Hajar to join them and form one alliance of the armed groups.